Yellow, hairless, segmented thorax with black markings or stripes. High pitched buzz in flight. Often makes nests in attic rafters, tops of sheds and in cavities. Aggressive. Females sting multiple times. 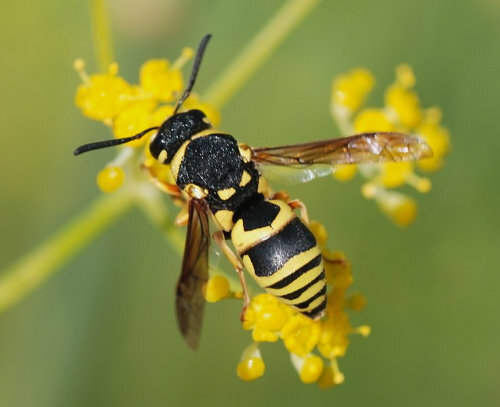 An adult wasps is similar to a honey bee in length at around 12-15mm. A nest can be 8,000 strong by mid to late summer. 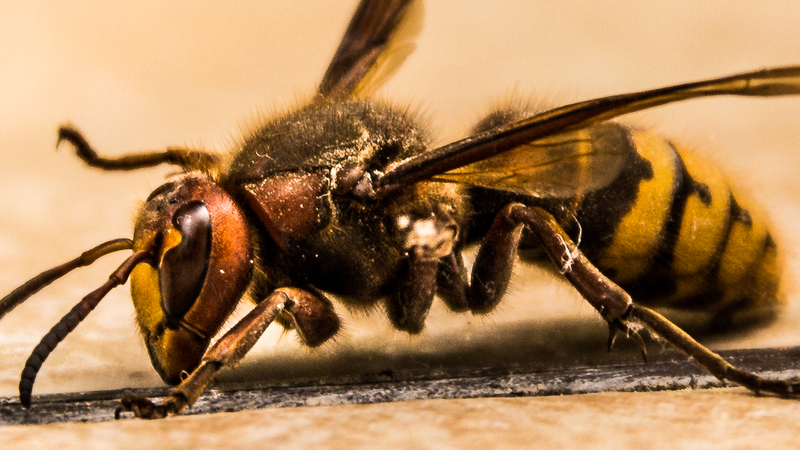 The colouration of hornets is different to wasps. They have more of a brown and golden pattern to their smooth thorax than the yellow and black of a wasp, and are considerably larger. Adults can be up to 30mm long. Can sting multiple times. 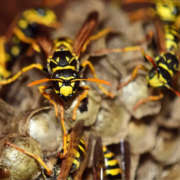 Smaller nests that wasps. 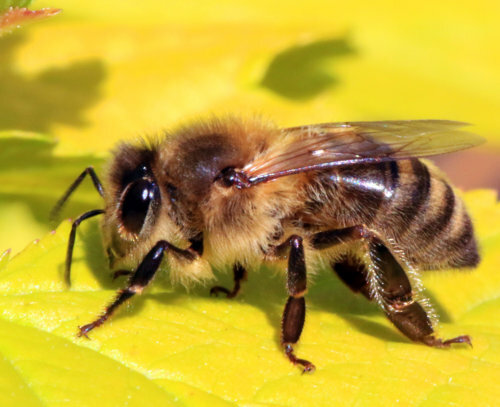 Honey bees are wasp shaped, but have fur on their thorax. They come in many colours from yellowy golden brown to almost black and variations of these in bands on their body in between. They live in large colonies which can commonly contain over 20,000 individuals, and survive through the winter on their honey. The females can only sting once, which they do in defence, leaving the sting in you with venom sack attached. Swarms form when queens leave the nest to set up new colonies. Honey bee swarms can often be relocated. 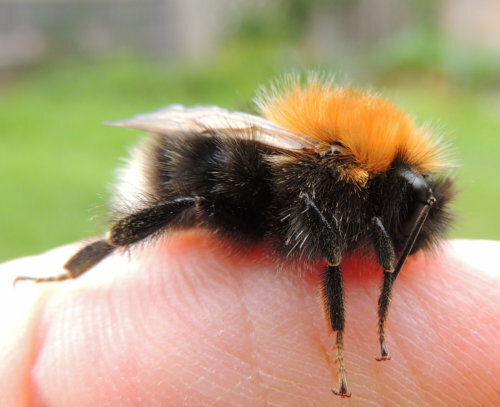 There are 24 types of bumble bee in the UK with a wide variance of size and colour. The three most common are the garden bumble been the white tailed bumble bee, and the relative newcomer, the tree bee (see below). Bumble bees are rounder, more furry and generally bigger and gentler than honey bees, which are more of a wasp shape. 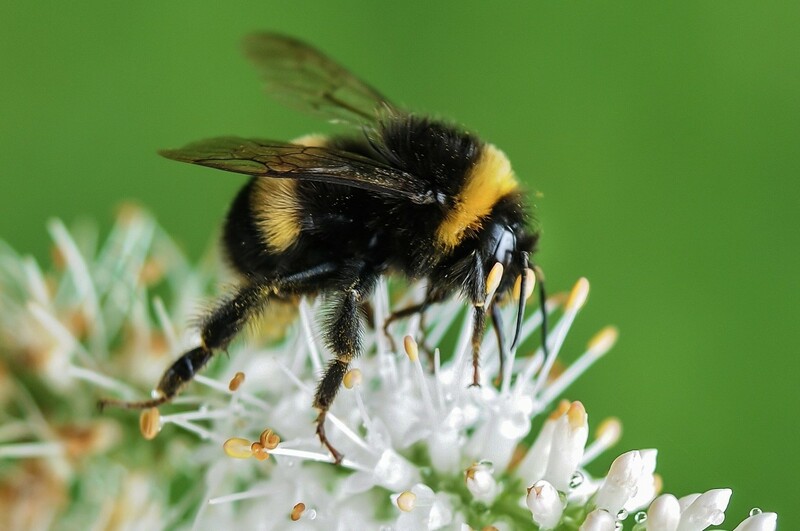 Bumble bees like nesting in areas like compost heaps and under decking. Quite slow compared to the busy honey bee. Not at all aggressive, rarely sting, and important pollinators. Tree bees are not native to the UK, but since they arrived from North Eastern Europe they have thrived. They are easily identified, with a golden head, black body and distinctive white bum. They build quite a small nest of up to around 200 individuals of many different sizes. Because they originate from colder climates, they emerge early in the spring. Unfortunately they very much like the eaves and soffits of houses and high wall cavities. They have a need to fan each other around the nest entrance on warm days in order to keep cool, with sometimes a large number of the colony doing this all at once. This has caused alarm with many home owners, who think they have a huge nest developing, and want them removed. Tree bees also commonly inhabit in birds’ nests and in this situation we can help with our bee relocation service. 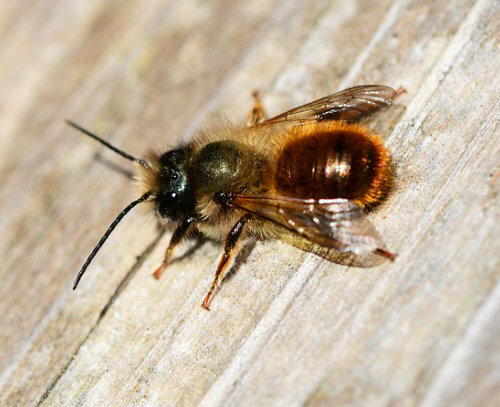 Masonry or Mason bees are usually smaller than honey bees. The masonry bee is solitary and does not live in colonies. It excavates its own horizontal, round tunnels, often in the mortar of stone walls, where it leaves pollen, nectar and an egg, and then moves on. Prefers south facing walls and very unlikely to sting. There are about 20 different types of masonry bee in the UK. Can cause quite a lot of damage to pointing and masonry bee treatment may be needed. Usually active only in spring and early summer. If you look close up, you will see their powerful jaws. Look like black bumble bees but upper part of their abdomen is bare and shiny. Males quite aggressive, hovering in front of people near their nests, but like all bees and wasps, only the females sting. Tunnels into wood to lay egg and creates perfectly round entrance holes about the diameter of a small finger, so can cause quite a bit of damage. If the wood is painted or varnished, it’s less susceptible. Coarse sawdust usually found underneath holes, and you may even hear them beavering away inside the wood. Overwinters and emerges in spring. 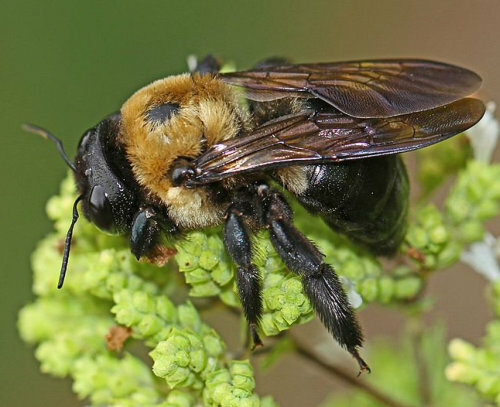 You may need a carpenter bee treatment if you have them.